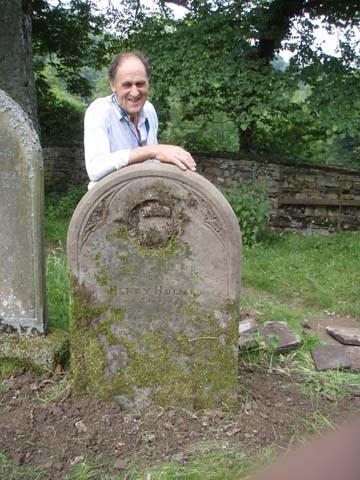 Aysgarth church is the first in Richmondshire to start re-erecting gravestones. Richmondshire District Council regularly sends its topple testers to check on gravestones in churchyards and cemeteries to ensure they are safe and won’t topple over and maybe kill children. But in 2009 Carperby farmer Alastair Dinsdale asked Aysgarth Parochial Church Council (PCC) to consider re-erecting some of those which had been laid flat. When, in early 2010, the PCC contacted the district council’s head of open spaces, Gary Hudson, he happily came along with David Lodge, the ground maintenance supervisor, to explain how it could be done. Alastair then raised the gravestone of one of his ancestors to test the suggested method (see below). For those researching their family history the churchyard (one of the largest in the country) is a useful source of information about those buried there since the 19th century. Alastair is particularly keen to raise gravestones so that the inscriptions can be protected from water and ice. Even some of the upright stones have deteriorated since Evelyn Abraham and Marian Kirby listed them in 1992. Without that list it would not have been possible to locate the grave of John and Margaret Fawcett “of Cote near West Burton”. He died in 1836 and his wife in 1846. Dianne Powell in Australia had asked if we could send photographs of the gravestone which we did. Some of those who attended the Gravestone Coffee Morning on June 26 had also been researching their family history. Relatives of one family had come from New Zealand a few years ago and had been saddened to find that the gravestone of their great grandparents (Edward and Elizabeth Graham) had been toppled. This was one of the gravestones re-erected during the community work day in September. Nine gravestones were successfully raised that day including those of Thomas and Emily Shannon of Carperby which has a a memorial to their son John who was killed in action in France during the First World War. Aysgarth Parochial Church Council (PCC) decided to publicise details of these so that the families would know about the work day. This led to descendants of the Shannon family making contact (one from Inverness) and those of Jane Hammond, including one who lives in Bowness in Windermere. An Aysgarth family has also asked for that of Catherine Wood to be added to the list. She died during the Spanish flu epidemic in 1918. If anyone wants information about gravestones in Aysgarth churchyard they can leave a comment on this post. This is so exciting!! I am a descendant of John and Catherine Fawcett and would love any help especially photos of gravestones, any Tennant/Fawcett items. Thankyou from Australia,…Yvonne. We visited Aysgarth – travelling up from the Cotswolds – this weekend to try and track down the gravestone of my ancestors Thomas and Emily Shannon – we couldn’t locate it – any information would be gratefully received. I did send them details of the gravestone and where to find it.